Ok, I know that it's Tuesday, but yesterday was a rough day round here. I actually got up early with all these good intentions and was doing pretty good with them. I was just finishing up measuring out the dough for my first loaf of bread (ever!) when I heard Roger calling me from the living room saying that Ben needed my help and that he was bleeding all over. Cue sigh from mom..life with boys. Well, this time he was bleeding all over. It seems that while they were practicing their golf swings, Roger told Ben to move because he was going to hit the ball and Ben did move..right behind Roger. Yep, you got it, Roger hit him in the head on his back swing. I swear that my Works for Me Wednesday post should be about keeping a dark red washclothe on hand for just this kind of thing. Kids! Luckily Ben was ok. He had a small goose egg and it had split the skin. He refused all medication and by last night the goose egg was almost gone and he said it didn't hurt. 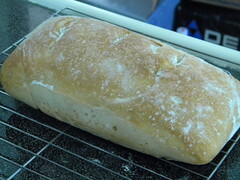 Well, our first loaf of bread turned out gorgeous, if Roger and I say so. Ben wants me to go buy some store bread. He's the one who isn't so sure when Mom suddenly changes something, but this bread really was tasty and it's so much cheaper to make it than buying loaves at the store. I'm looking forward to trying out some of the other breads in this cookbook. This one was sooo easy. If anyone wants the recipe, just let me know and I'll either post it here or send you a copy via email. Tackle It Tuesday - Kids? Finish It Friday - A Slow Day? Tackle It Tuesday - Laundry!